For warmth and comfort on those cooler mornings and evenings, the Kids and Adults Layer Soft Shell branded vest is a great choice when you want to keep your staff, team members or customers warm. Perfect for early starts on the job site, or late afternoon and evening sports training sessions, these vests feature a micro fleece lining for extra warmth. Available in three colours – black, navy and charcoal – and in sizes from small to 5XL, these vests will suit any business, sporting association or community organisation, and with an embroidered logo, your brand will always be on show. 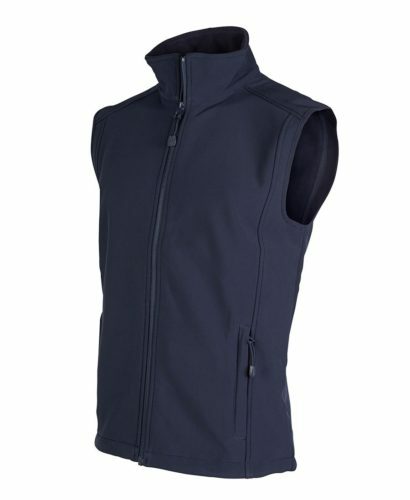 Made from 94% polyester and 6% elastane, the vest offers both durability and stretch. With two zip up pockets and an internal mobile phone pocket, there’s plenty of space for keys, mobiles, and other accessories. Considering adding or updating your promotional merchandise range? These vests are a great choice! Warm enough for the cooler temperatures yet yet allow enough movement for outdoor activities. The Kids and Adults Layer Soft Shell Vest is a great choice for promotional apparel and will help market your brand or sporting organisation.